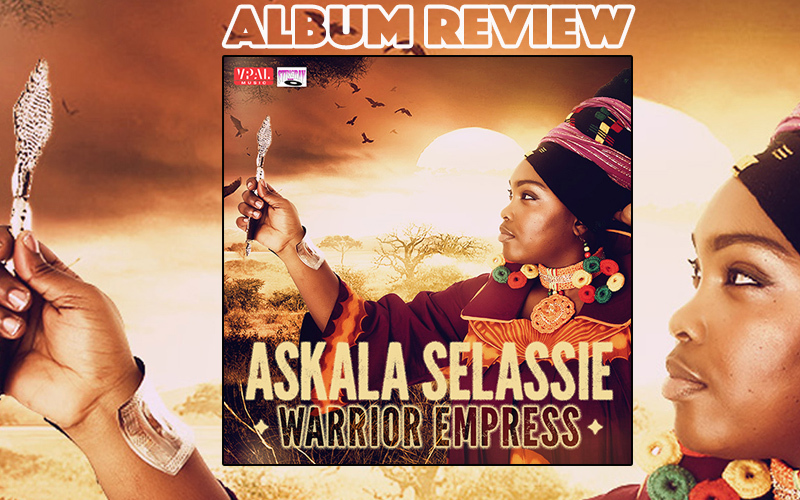 Good news from the UK: The London-based reggae singer Askala Selassie has put out her long anticipated debut album, titled Warrior Empress on Stingray Records and released by VPAL Music of VP Recods. Askala was once known as the youngest Wailing sister since she had been touring with The Original Wailers band in 2005 with the age of 21. She enjoys performing on stage as much as freestyle chanting on dub sound systems, and, so, the versatility of her music is reflected in Warrior Empress by a diverse set of 15 songs, with a variation of styles ranging from One Drop, Roots and Dub to Lovers Rock. Some might say, the profound spirit of Dub is not to be mixed with the soft and sweet vibe of lover’s tunes, but in Askalas heart is enough space for all kinds of Reggae genres. The singer has a strong international crew behind her album works: The twelve songs and three dubs were in large part recorded at the Stingray studio in London. Further cooperations are given with Altafaan Records for title track Warrior Empress, Big Neck Productions for This Love feat. Ginjah, Bizzari Records for Love You Always and with Genis Trani who produced the Powa Riddim of My Life for GreenLight Soundsystem in Barcelona. Let’s start right away with the killer tunes of the album: My Life and Hard Work plus each dub version cannot be more inspiring. These songs have been going around for a while on big soundsystem dances in the UK as special dubplates. Now that they’re out on the market, they must be selling like hotcakes. At the latest since the release of her two dub singles Salute and Faithfull & True on the King Shiloh Majestic Music record label in 2012 she is a highly respected Dub Empress in the circle of European soundsystem culture. When listening to the first mentioned songs, you just feel that Askalas lyrics and vibes come from the heart. If you were lucky to catch her live at United Nations of Dub or the Dub Academy at Rototom Sunsplash Festival in 2014 where she was the only female booked alongside many male top acts to spread her message through the mic, you would know that she has the talent and the vibe to sing and freestyle at high standards. Even though these dub tunes are somehow outstanding from the rest of the album, there are more big treasures among the songs. The title song Warrior Empress, a catchy one-drop single, in which you have the pleasure of enjoying her powerful and voluminous voice, is one of them. She dedicates it to the women of this world by proclaiming her greatest respect for all the lionesses. She sings: “We trodden through the hills and through the valleys, seen so many things and I heard so many stories. Always talk about the men dem pon the battlefield, what about the women dem on the battlefield?” It was recorded at Tuff Gong Studio, played by the Fire House Crew band, and is enriched by the horn-playing of no one less than Dean Fraser. The video of this song premiered on Reggaeville a few months ago, and was shot in Askala's hometown London, with a cast comprising family and friends. There are two feature songs with male colleagues from Jamaica. One is Rise Up feat. her good friend Ras Charmer. It is the result of a personal meeting of the two singers when he stopped by in London while being on tour in Europe. Rise Up is, as the title depicts, a song that encourages the people, especially the youth to rise up from the down pressing moods and keep on going. The vocals of Askala and Ginjah in This Love were put together by Big Neck Production since the song has been existing many years already. She recorded it with the age of 20 and what you’re listening here is her original voice from that time, 10 years ago by now. She is getting serious in her lyrics when she compares love with a Rocky Road to travel in the same named song. I’ll Wait and Love You Always are further love songs through which she confesses her eternal love for her partner. These songs have a classic one drop rhythm, a pop influenced melody and are made for the loving and romantic moods. The song Jamaica reveals her great desire to be on this particular island. “Yes I’m home in Jamaica land, place with the sun and the sea and the sand. It’s a sunny day!”. In Rebel she pays attention to the social injustices of the world and encourages once again to rise up and hold together. “Rasta man Rasta woman, inna dis ya time you haffi stand and be strong. Let me sing again: Rasta man Rasta woman, I hope you know the journey will be rough and will be long.” The Riddim of this tune originates from I Jahman Levi’s well-known hit Moulding. Askala Selassie means: The Fruit of the Holy Trinity. She was baptized to this name at the age of 14. A song of praise represents her believe in Jah in this album: Holy, the opener of the album. The text is a scripture based in the book of revelation. Askala used to sing this song also as the opener of several shows. The Warrior Empress dub version serves as the closer of this LP. Five years have passed since the release of her last EP Put Jah First. With Warrior Empress, she returns with a packed set of new songs offering something for everyone. If you haven’t heard Askala Selassie’s music so far, you should immediately catch up on this.